Mikkeller Cream Ale is yellow and has both a foggy complexion and sunny radiance; highlights are not only bright but blinding yet good luck making anything out on the other side. Translucent yes, transparent no. And whatever foam-dome blossomed from the pour cracked into pieces like a hollow shell, fragments of which wash up against the glass and stay there. Colours that emulate its aromas and tastes: orange from a fresh grated peel; yellow from the squeeze of a lemon; green like wet grass clippings. While the more substantial malts have resulted in more body and texture, hops are in the driver's seat for flavour. It'd be easy to mistake this for a pale ale. Prior to this review I would have told you there was no cream ale in the world worth paying $4.35/ 330ml bottle for - and, to be clear, I'm still telling you that. That kind of change can buy you much better beer (and, by the same token, similar beers can be had at much more reasonable prices). Then again, who am I to tell you how to spend your money? A - Served a cloudy golden-yellow color with a finger of frothy white head. The head fades down slowly leaving behind some nice lacing. S - Aroma is a mix of light sweet caramel malt, light yeast, and a bit of corn, grain, and bread. T - Starts off with some light sweet caramel malt with some grain and corn with a touch of yeast. Through the middle some more sweet grains come through. The finish is a mix of light biscuit sweetness with some grain, bitterness, and some yeast flavor. M - Light bodied with moderate-minus carbonation. Feels smooth with a light and very crisp finish. D - Very drinkable. Nice cream ale. Good yeast and grain flavor and the beer is super refreshing and balanced. Hazy pale orange, a few fingers of white head with some webbed lacing and chunky retention. Juicy citrus hop notes on the nose with some big yeast wafting from the glass. A bit bready, lightly floral - unique to any 'cream ale' I've come across. Taste is more along the lines of what I had expected, grainer malt notes and solid, but restrained hopping still moderately juicy and citrusy. A bit drying in the finish with some yeast. Medium feel and excellent drinkability, wish I could have access to this year round. A well assembled cream ale. The beer is clouded deep yellow, a white small head with little lacing. The smell is sweet citric, orange jam with lime, a spicy note. Tasting of sweet bread upfront, then oranges and lemons, a herbal bitterness at the end. Medium high carbonation, small bubbles, rather soft and fresh. An easy drinkable ale, a bit short on bitterness. Tasted at a beer sampling at De Klomp, Linköping, Sweden. A - I like the way that when pouring this bottle the bubbles started collecting on the sides of the glass right away, like tiny frog eggs. The color is a slightly frosty lemon-honey. And the head is a nice clumpy yeasty splotchy cloud white. S - Some hops, but lots of citrus smells. Sweet crystalline malt smells. Has a clean fresh smell. Like sweet air after a spring rain. Very soothing. Makes me think of lazy walks through a hop field in the Belgian countryside. T - Initially very hoppy and bitter, much like an amber ale or an IPA. It's a bit too caustic and drying for me. At least when I imagine this style of beer. The bottle says it's all hop but I can't help but feel a little corn blandness. M - Surprisingly doesn't quite live up to the name. I wish it were a bit creamier. It is a bit effervescent and a bit smooth, but bitterness takes away from the "cream"
D - Not quite what I had dreamed it would be, but pleasant none-the-less. This isn't one that I will reach for again anytime soon. Served on-draught into a Mikkeller goblet at the Mikkeller Bar in Copenhagen. Reviewed from notes. A: Pours a one finger head of white colour, slight cream, fair thickness, and poor retention (especially for the average ABV). Colour is a cloudy gold. Sm: Cream, bittering hops, and barley. A moderate strength aroma. T: Cream, bittering hops, and slight amber hops. Complex for the style; normally I wouldn't expect IPA style bittering hops in a cream ale, but it's well executed here. A far cry from Kilkenny, but lovely. Well balanced and built. Mf: Smooth on the open with bittering hop coarseness on the climax to bring out the flavour. Wet and refreshing, but less creamy than expected. Dr: 5% ABV makes this a good session beer. A great refreshing very drinkable beer, but I do expect more from me favourite brewer. It's also expensive as all hell (which doesn't influence my rating). (3.75) A: Hazy straw colour with a finger of white foam that recedes promptly. (4.25) S: Grains, orange, cloves, light pine, lemon, and floral elements. There’s a slight funky quality to this that comes across fresh and slightly tart. Excellent. (3.5) T: Grain, floral qualities, light orange, faint pine, and spices. This leans towards a fairly bitter taste (pine and floral) with a bit of fruit sweetness. Slight funkyness is less present than aroma indicated. (3.75) M: Medium bodied with moderate carbonation. Smooth and creamy. (3.75) D: This is a nice hoppy and bitter ale that has a creamy texture. The aroma was standout highlight for me but not something I would likely revisit at the price. Poured into a Delirium chalice. Bottle conditioned. A hazy golden-amber hue with intense carbonation and fine yeast sediment. Produces a huge head of creamy white foam with good retention; this slowly collapses to a surface layer. Nice lacing. Aroma of light malt with hints of earthy yeast, grain, floral hops, mild citrus and stewed hops. It smells enticing. Tastes of light malt with a hoppy character and a dry finish. Notes of floral hops, subtle citrus, earthy yeast, grain and stewed hops. A faint quality of noble hop aroma and a whisper of solvent in the background. A restrained, dry bitterness upon swallowing. Mouthfeel is smooth and full-bodied for the style, with prickly carbonation. A creaminess comes through once the carbonation has died down a little; very nice on the palate. Somewhat astringent, with an aftertaste of bitter aromatic hops and yeast. Very tasty, and goes down all too easily. Not sure how true this is to style; I suspect the original cream ales were less hoppy. But I'm not complaining - this is nicely balanced and very drinkable. Well worth sampling if you have the chance. A - Pale orange in colour, with a frothy white head which receds quickly to a collar, leaving a white cloud in the middle surface. Not much in the way of lacing. S - Fresh peach and plum, strawberry and cream, yeast and some booze. T - Canned peach, tangerine, strawberry, cream, under-ripened white grapes, champagne. M - Quite tart, thin to medium bodied, not at all creamy, high carbonation, dry finish. O - Wonderful aroma, has some belgian qualities, nice sessionable ale. Mikkeller Cream Ale is unparadoxically: a Cream Ale, which a style of beer that originates from the US of A. 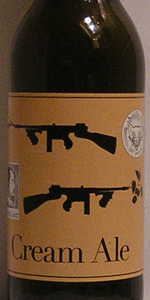 Cream Ales were also produced by Canada during the prohibition era as a style that gained popularity amongst sneaky American drinkers, and further refined after prohibition, which ended when Al Capone was sent to prison for killing Sean Connery’s character in Stanley Kubrick’s seminal film ‘The Untouchables’ (which Kevin Bacon was awesome in BTW). It is a style that is brewed with Ale and Lager yeasts and usually contains adjuncts like corn and rice. This is my first ever Cream Ale. Ever. Srsly. A: Pours a hazy saffron yellow body with a wispy white 2 cm head that sticks around for a while. I do generally like the look of Mikkeller’s brews and this one is no exception. 9/10. S: Sweet notes of malt, lemon and a distinct pineapple note. Aroma is almost as delightful as the bright yellow bottle label which appears to have been drawn by a kindergarten student. The balance of the fragrance hints at a sweet/malty Cream Ale. 8/10. T: So this is a Cream Ale - easy to drink but not very exciting - there are sweet malts forward, then lemon citrus and floral hops lead to a light(ish) bitter finish. If you’re looking for big flavours you’ve definitely come to the wrong place. 6/10. M: Mid to light bodied, it really lives up to the word “cream” in the style with a creamy carbonation though. 8/10. D: It’s like the original creators of the style were aiming to make a beer that’s easy to drink... easy to drink?! Beer?! I scoff at these olden days American beer style creators. That said I think my palate has been destroyed by years of American IPAs... either way I have American brewers to blame for my current Cream Ale predicament, damn you AMERICAAAAAN BREWWWAAAS!!! Overall I would have loved this beer 5 years ago, today = pass. Oh yeah, and because this is a Mikkeller beer it cost me an arm and a leg...... I got better*. 7/10. Food match: Continuing the reference if you’ve skipped ahead to my footnote and still didn’t get it: Newts. Seriously though: Mild cheese platter with artisanal breads. *Python reference - haven’t had one of them for a while now have we? Pours pale yellow.Foggy.White persistent & dense crown.Medium size bubbles.Wheat & yeast aromas,citric notes.Crispy bitterness.Dry piney & gentle hoppy flavor.Very refreshing sensation & easy drinkability.Light body & correct carbonation.Very well balanced flavors & aromas. Bottle from hopduvel in Gent into Chimay chalice, straw gold color, finger of off white head. Taste is piney bitterness, a little citrus, very smooth, I got some cream soda aftertaste halfway through, but its not overly creamy. Very sessionable. In belgium I would compare this to a Taras Boulba, its a very similar beer. Cloudy straw in color. Lightly yeasty in the nose. Light and very drinkable (but too light). Mildly dry and bitter on the finish. Would make a decent lawn mowing beer.